Sol continues to present St. Vincent communities with opportunities to win exciting prizes. The company recently announced that their highly anticipated promotion Free Fuel For Life will begin at select Sol service stations on January 15, 2016. One lucky customer will claim the ultimate prize of Free Fuel For Life from Sol, valued at EC$4,800 per year. With every EC$50 spent in fuel at participating service stations across the island, customers will receive an entry form to participate in the competition.The promotion will run for a period of 10 weeks and conclude on March 25, 2016. The grand prize-winner will be selected on April 1, 2016. Customers participating in the Free Fuel for Life promotion will have multiple chances to win prizes with the region’s leading energy company. The promotion will feature two weekly activities: ‘Win it Wednesdays’ and ‘Fuel up Fridays’. On select Wednesdays throughout the promotion period, a special team will conduct weekly draws at pre-determined stations. The prize for these weekly draws will be fuel prizes valued at EC$250. The Fuel up Fridays promotion will take place on select Fridays during the promotion period, featuring a phrase posted to the Sol Facebook page. The first nine persons to come to the listed location, purchase EC$50 in fuel between 3 p.m. and 4 p.m. and repeat the phrase, will win a fuel voucher of EC$50 for their next visit. 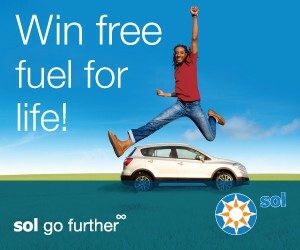 For the official rules and regulations of the promotion, customers may visit www.solpetroleum.com/freefuelforlifestvincent. The launch of Free Fuel For Life and the weekly promotions to customers in the Vincentian market is an example of Sol’s commitment to local customers and to show appreciation for the continuous support. The promotion has already had an extremely successful run in Barbados, St. Lucia and St. Maarten.